The dark comedy tells the story of a mime’s infatuation for an attractive waitress, and how his fantasies about her soon turn into an obsession he cannot escape. The animation is built on the drastic contrast between the mime’s incapability of distinguishing his day-dreams from reality, and the waitresses’ genuine fear for her safety. The Mime begins as a love story between the two protagonists, and the viewers are invited to find the mime’s actions such as playfully watching her, making her jump and touching her hands humorous and light-hearted as we know it is part of his act, however the audience then realises his perverted intentions and the acts of staring, following and touching that are repeated at night suddenly seem sinister. The mime is both seen, and sees in black and white; this factor almost makes the watchers pity his lack for social queues, until the end when he finds a new victim. 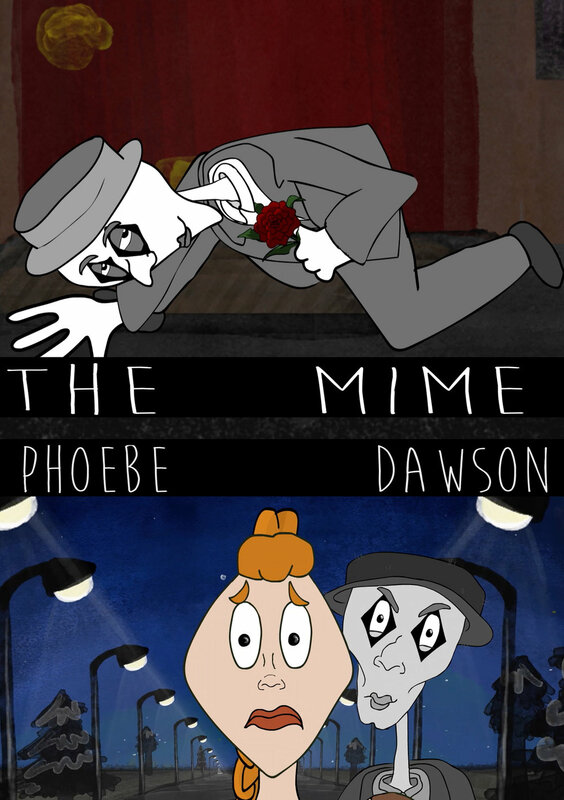 The viewer is invited into the mime’s consciousness and encouraged to experience the story from his distorted perspective: the overall humorous tone of the animation is countered by the underlining invitation to a more profound discussion around the issue of consent.